Presumably the same can be said for the act of learning. So have you ever wondered what steps you go through when you learn something new? It doesn’t just happen in a flash. You don’t just snap your fingers and new skills suddenly appear. Or new insight is absorbed. The truth is that you go through a series of stages whenever you learn anything. 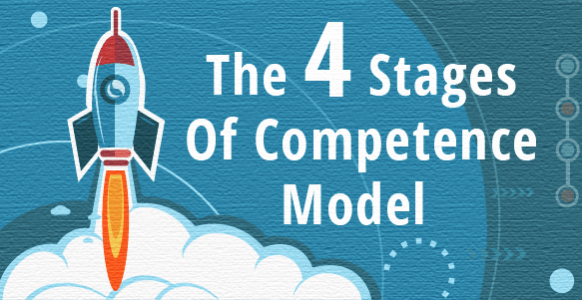 And those stages are known as the 4 stages of competence model. Some people call them stages of learning. Or the conscious competence learning model. The original name, though, was the 4 stages of competence. They were created by Noel Burch in the 1970s as a model for learning. The competence element has to do with your awareness of what you know as you progress through the 4 learning stages. 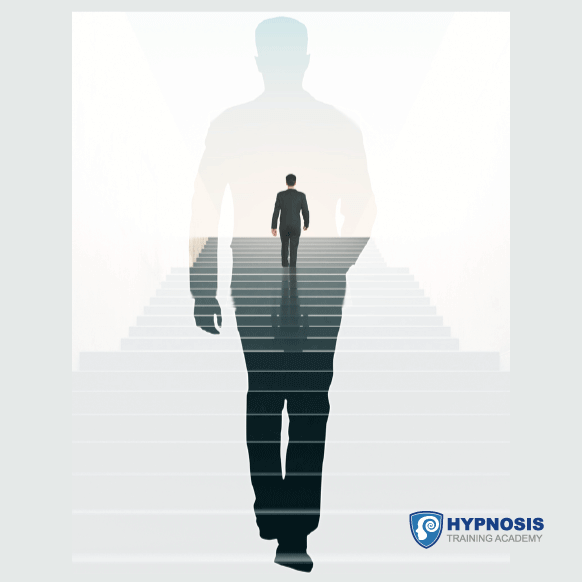 Understanding each of the stages will help you enormously when you’re working with hypnosis clients and you’re trying to initiate a transformation in their lives. Remember, it often takes time for an “aha!” moment to materialize! Which is why understanding the process involved is very important. Clients and subjects won’t always change at the pace you’d like them to. So be gentle with their journey, as everyone is on a different one. 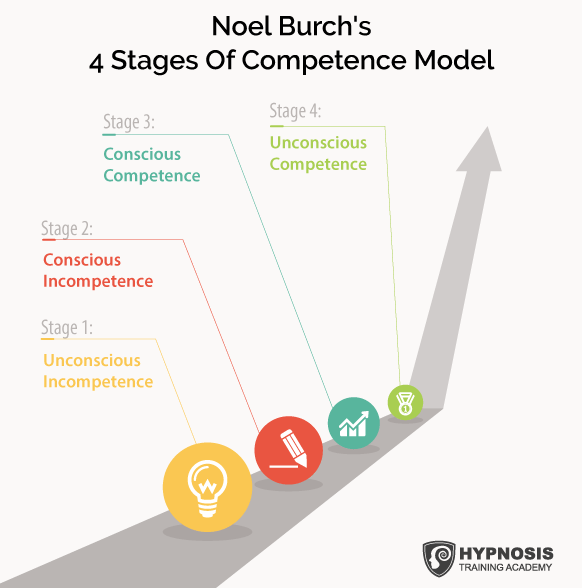 Here are the 4 stages of competence according to Burch’s original model. 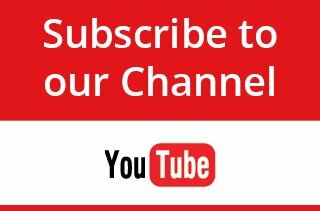 Later on we’ll also take a look at how they can help you and your clients avoid frustration and disappointment when learning a new skill or changing a behavior. It’s the beginning of the learning curve where you aren’t even aware of how little you know. It’s the time before you learned how to do a skill and before you were aware that you needed to learn that skill. For example, right now you’re probably a decent hypnotist. You’ve probably got a bunch of techniques at your fingertips that you can call upon as and when you need them. Take power words, for example. They’re those everyday words, such as: “and,” “as” and “because” that you use to link ideas together and create a smooth flow of language. 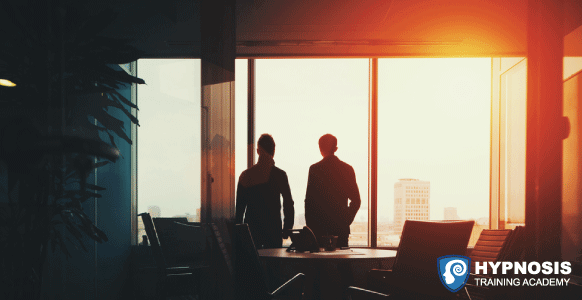 When you get used to them, they help you bypass your subject’s critical factor and connect with their unconscious mind. 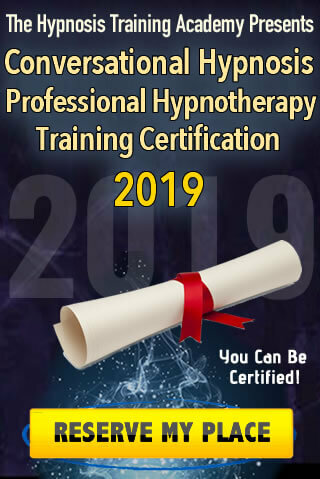 But when you first started using them, you didn’t realize how powerful they were or how easy they could make your life as a hypnotist. You weren’t able to benefit from their enormous potential because at that stage you weren’t even aware that you needed to learn them. In the beginning of the learning process, before you start learning what you need to learn, you are naturally unaware of how little you know. Being unaware is the unconscious element referred to in the title. And the incompetence element refers to the fact that you haven’t acquired the skill – or competence – yet. It’s the part of the learning curve where you know about the skill you’re trying to master, but you’re still in the early stages of learning. So you’re aware of the skill and also aware that you’re not very good at it yet. For hypnotherapists, this might happen when you’re practicing your exercises in the beginning of your career. Sometimes it’s easier to practice with a friend or colleague, someone who can pretend to be a fantastic hypnosis subject while you pretend to be a supreme hypnotist. Because you’re still learning your craft, you’re going to make mistakes. By pretending with someone who’s eager to help you learn, you can make those mistakes without getting into any trouble or without upsetting a “real” client. A good analogy for this stage is the process of learning how to drive. When you start learning how to drive, there seems to be a lot to remember. You have to use both hands, both feet, keep your eyes on the road, watch out for other vehicles and pedestrians, indicate whenever you want to make a turn, check your mirrors for oncoming traffic, execute the correct maneuver when you come to a junction, and so on and so on. Your attempts are clumsy and awkward and making progress seems to be a slow and painful affair, mainly because you’re aware (i.e. conscious) of all the mistakes you’re making. This is the stage where you recognize (are conscious of) your lack of skill (incompetence) and can often feel frustrated by how long it’s taking you to master it. During this stage, you have the technical ability, the know-how, to perform the skill, but it’s not yet automatic. You still have to focus and concentrate hard on what you’re doing. You might recognize this scenario from the first time you practiced hypnosis on a subject, either during a social occasion or when you started your hypnotherapy business. Even with all the skill in the world, and with every possible technique under your belt, that first subject is never going to be easy. You know what to do, but it’s not as smooth and automatic as it could be. You haven’t been doing it for long enough for it to become habitual, for the words to roll effortlessly off your tongue. To simply respond to what’s happening in front of you without having to think about it. And that means you’re likely to make mistakes. To stumble over your words. To forget something. It’s only natural, of course, but it can drive you nuts. You’ve got the skills and you know how to use them, but you’re also conscious that they haven’t become ingrained inside as deeply as they might be. Continuing the driving analogy, this is the stage where perhaps you’re taking your driving test. You’ve practiced all the maneuvers and you know exactly what to do and when to do it. But the pressure of having to do it on demand – when getting your license depends on doing it perfectly – can cause you to doubt your abilities. To make mistakes. Because you’re still unable to completely relax and perform the skills automatically. You’ve consciously acquired the skill or competence in question, but it hasn’t yet been cemented in your brain to become a habit or routine. In the previous stage, you have the skill and you know you have it, but you’re still using it consciously. You’re still thinking about it instead of forgetting about it and using it instinctively. By stage 4, however, the skill becomes instinctive. You don’t have to think about it, you just do it. You’re on automatic pilot. You automatically react to what your subject is telling you. 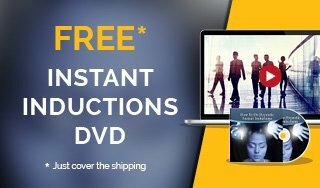 You take them deeper and deeper into trance so that communicating with their unconscious mind is as easy as taking a breath. For the driving analogy, this is the stage where all those little things come together into one operation you call “driving.” You’ve passed your test and have become “a driver.” You don’t have to dwell on it – you just hop in the car and go. The skill has become automatic, a habit, something you can do spontaneously without having to think about it. In other words, the skill has become unconscious. You’ve well and truly learned it. Job done. And now you can go on and learn something else. Just to be clear, this learning model isn’t fiction. It isn’t something that happens to some people. It happens to all people, regardless of their intelligence or previous training. Everybody learns things in this way, following these 4 stages of competence. 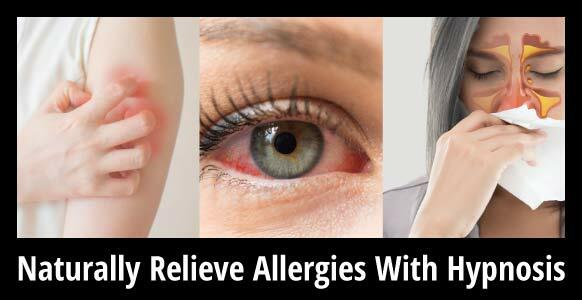 How does knowing that help you? If you’re learning hypnosis, you must have been there yourself. There must have been times when you got frustrated, when you felt incompetent at some level. When you wanted to just forget about the steps involved in a certain technique and be able to reel it off. When you got disheartened because things just weren’t falling into place the way you thought they should or as quickly as you thought they should. Well, now you know why that was. It’s because of the 4 stages of learning. You can’t avoid them or skip a step. You might get through them quickly for less complicated skills, but you still have to progress through them in the same order. 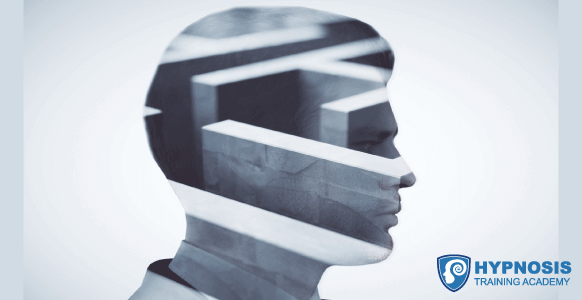 If your goal is to learn hypnosis and become a master of your trade, then everything you learn will go through these 4 stages of competence. Of course, you’ll progress through these stages at your own speed, depending on the circumstances you’re in and the number of times you’re able to practice the skills in question. But just knowing that could be enough to stop you from getting too frustrated, or too disheartened, because you’ll understand that it’s just part of the way human beings learn stuff. 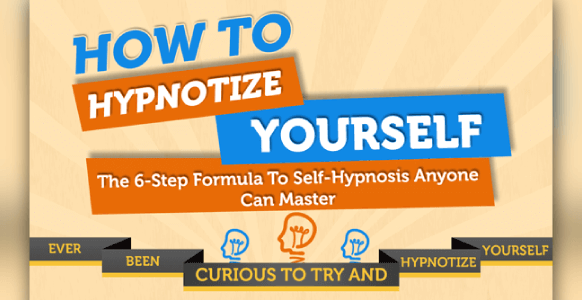 So it will help you become a better hypnotist. And it will also help the people you work with. Once you understand the 4 stages of competence, and what you have to go through to learn something, you can explain it to your subjects to help them navigate the learning process more effectively. You’ll be able to reassure them so they realize that whatever changes they might want to make will take time. They’re learning new behaviors to replace old ones, and they need you to guide them through this learning process. Once they understand the stages involved, they’ll be more likely to avoid frustration and disappointment on their way to acquiring their new skills. For example, suppose your subject feels their life is going nowhere. Perhaps they feel trapped in their life, unable to move forward. They’ve come to you for help because they don’t know why they feel that way (unconscious incompetence). During hypnosis, you help them understand why they feel stuck, using information you gathered from your pre-talk. You make them aware of how they feel using echoing, perhaps, firing their thoughts back at them. Then once they are aware, you help them discover a way to become unstuck. So now they’ll know how to become unstuck although they might not have the skills to do anything about it (conscious incompetence). Together you can come up with solutions. Using visualization, perhaps, or something like the dynamic mental imagery induction. In that induction, your subject finds a path that leads to some discovery, or the answer to a question, or the solution to a problem. Once you have guided them through that induction successfully, they’ll know what they have to do to move forward with their life (conscious competence). You might also like to give them a post-hypnotic suggestion that will help them put this knowledge into practice. Maybe they need to exercise more. Or to eat smaller portions. Or to give up smoking. 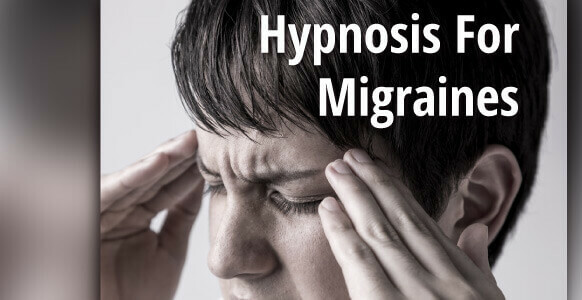 A post-hypnotic suggestion can give them a trigger that will enable them to do or stop doing whatever activity or behavior they need to deal with. Once they’ve done it enough times, they’ll start doing it (or not doing it) automatically, and it will become an unconscious competence. Here is another tool that works in a similar way. 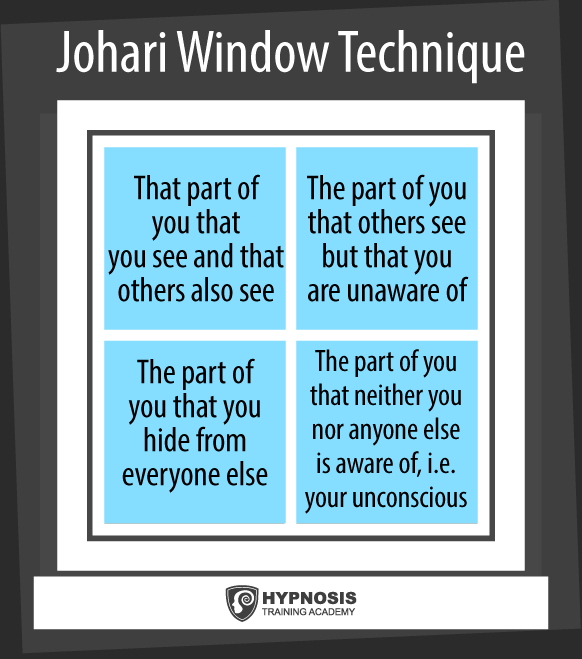 The Johari Window was created by psychologists Joseph Luft and Harrington Ingham and gets its name from parts of their combined first names (Jo and Hari). The Johari Window is really a self-help exercise. The idea is for someone to choose adjectives from a list describing their personality. Their peers choose from the same list, and the choices are inserted into a two-by-two grid, which is the Johari Window. If you want to find out more about the Johari Window technique, check out this insightful video: The Johari Window: Discover What People Think & Then Find The Hypnotic Story That Fits. 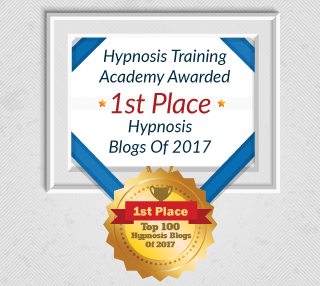 If you look at the list of items above, you can see immediately how knowing these 4 areas can give you more insight into helping people with hypnotherapy. For example, what things might someone be hiding from someone else? Are they in an unhappy relationship but unable to come clean to the other person? Are they struggling to cope with a situation at work but unable to make their feelings known to a manager or boss? Likewise, what things might others see that they are unaware of? Do other people see them as lazy, or pushy, or unwilling to cooperate? What clues can they look out for that will tell them how they appear to other people – in both good and bad ways? 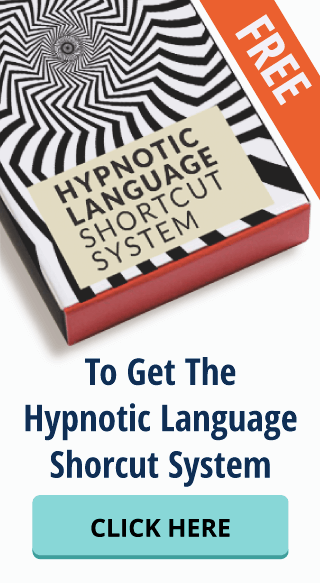 Using your hypnotic bag of tricks, these are the kinds of things you can help your subjects and hypnosis clients uncover (and use on yourself). And when you do, you’ll be making the world a better place, one person at a time.